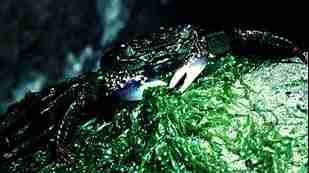 The Variegated Shore Crab has a carapace which is almost square, with its sides are moderately convex. The carapace surface is marked with many prominent oblique ridges, which give it it's other common name, Steelback. The upper segment of the walking legs are expanded and flattened, while the lower three joints are partly spined. The front of carapace has many rounded notches. One distinct, and one indistinct blunt spines (called a tooth), occur behind the eye tooth. 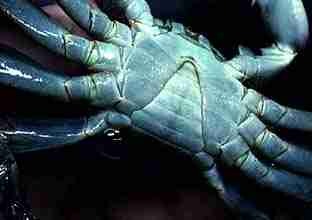 The male chelipeds can be very large, with large tubercles on the upper surface of carpus and claw (see photo above). Female chelipeds are much smaller than a male's. Does this affect their diet ? See the photos above to compare the cheliped sizes between the sexes. The Variegated Shore Crab occurs in two distinct colour forms. There is both a purple and an orange form. In the eastern purple form (above), the carapace is purple with lighter flecks or dark steel grey markings. In the southern and western orange form (right), the carapace is yellow-green with reddish-yellow markings. However, in south-western Australia some specimens of the purple form may be seen. New South Wales, eastern Victoria, Tasmania, South Australia to North West Cape, Western Australia. Also New Zealand and South America. The Variegated Shore Crab is found widely over rocky shores to above high-tide levels. 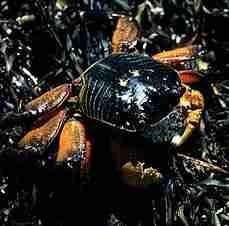 The abdominal flap of all male crabs is relatively small and triangular, while the flap for females is a broad oval. Females shelter their hundreds of eggs under this flap. 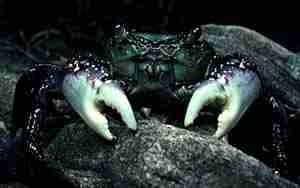 The Variegated Shore Crab is a very common, conspicuous, swift crab found on most non-tropical rocky shores. It is very tenacious, and can cling to rocks being battered by the full force of the waves. If disturbed, it can quickly run sideways to safety. It feeds mainly on algae but it is also a scavenger. Davey, K. (1998) A Photographic Guide to Seashore Life of Australia. p.56, New Holland, Sydney. Edgar, G.J. (1997) Australian Marine Life: the plants and animals of temperate waters. p.214, Reed Books, Kew. Quinn, G.P., Wescott, G.C. & Synnot, R.N. (1992) Life on the Rocky Shores of South-Eastern Australia: an illustrated field guide. p.71, Victorian National Parks Association, Melbourne. Marine Research Group of Victoria (1984) Coastal Invertebrates of Victoria: an atlas of selected species. p.120, Museum of Victoria, Melbourne.